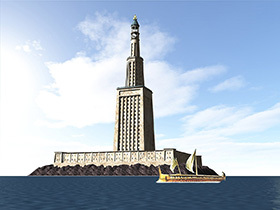 The Lighthouse of Alexandria on the tiny island of Pharos in the harbor of Alexandria, Egypt, is the archetype of all subsequent lighthouses and was one of the Seven Wonders of the Ancient World. It was one of the last of the original Seven Wonders to be destroyed, after multiple earthquakes reduced most of the original structure to rubble, and the Sultan of Egypt turned it into a medieval fort around 1480. The lighthouse was commissioned by the first Ptolemy, the Greek general who stayed behind to rule after Alexander the Great conquered Egypt, shortly after Ptolemy declared himself pharaoh in 305 BCE. Construction began around 280 BCE during the reign of his son, and took an estimated 33 years to complete, at an expense estimated to be twice that of the Parthenon. The tower was built in three stages with decreasing size, and stood over 300 feet tall. For centuries, it was one of the tallest manmade structures anywhere, ranking second behind only the Great Pyramid of Giza. Its light was provided by a fire burning close to the top every night, and was enhanced by a burnished bronze mirror. Many ancient descriptions of the tower describe a statue at the tower’s apex, and while many historians believe it was originally a statue of Zeus, it could have been changed to a depiction of a number of different gods or rulers across the centuries. After being lost for centuries, the ruins were rediscovered on the floor of Alexandria’s harbor in 1994, and it is possible today to visit them while diving.